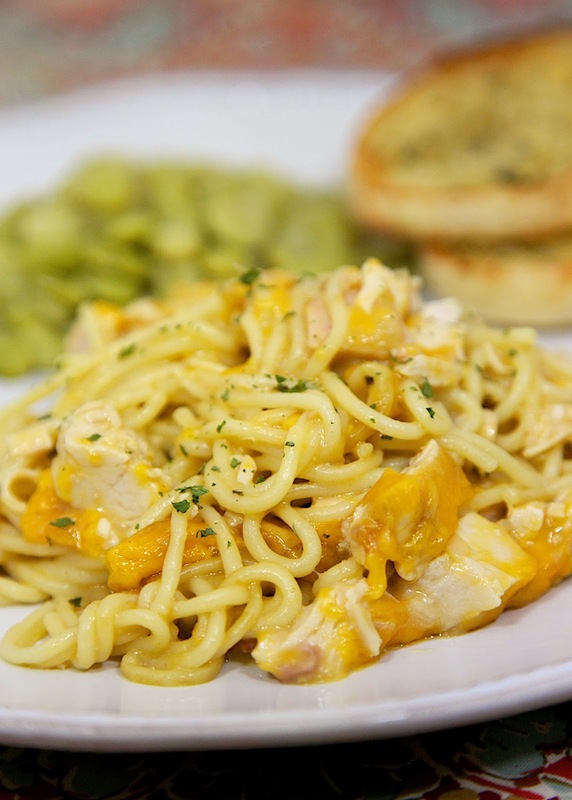 Chicken Tetrazzini - chicken, cheese, creamy sauce - so good we ate this 2 days in a row! Great make ahead meal or freezer meal. Comfort food at its best! Spaghetti, chicken, chicken broth, cream of chicken, cream of mushroom, worcestershire sauce, onion and cheddar cheese. Great for a potluck! Everyone LOVES this easy chicken casserole recipe! I love Chicken Tetrazzini. I have a couple of recipes on the blog, but I am always up to try a new version. This version is from my friend, Katherine. She posted this on her blog and it was just different enough from my versions that I wanted to give it a try. This is SO delicious! We ate this for dinner and again for lunch the next day. I really, really liked it. I loved the cheddar cheese. 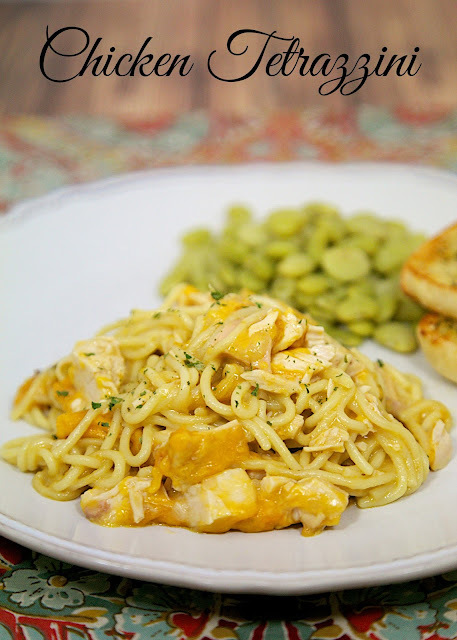 My Chicken Tetrazzini recipes use parmesan cheese. This was a nice change for us. I took a shortcut and used a whole rotisserie chicken. If you don't want to use a rotisserie chicken, just cook up 4 chicken breasts. You can also assemble this ahead of time and refrigerate it until you are ready to bake. Remove chicken from bone and chop. Discard skin. Set aside. Whisk together chicken broth, cream of mushroom soup, cream of chicken soup, Worcestershire sauce, and onion flakes. Stir in 1 cup of cheddar cheese. In a lightly greased 9x13-inch pan, layer cooked noodles, chopped chicken and then pour sauce over casserole. Top with remaining cup of cheese. Bake uncovered for 30 minutes - 40 minutes, until bubbly. I feel like the queen and king of England liked my dish! ;-) Thanks for sharing. Could this dish be split in half and frozen? Way too much for my small family and there is nothing I like more than cooking once and having 2 meals. It does sound delicious. that would work great! Enjoy!